MStereoProcessor, Software Exciter/Enhancer from MeldaProduction. 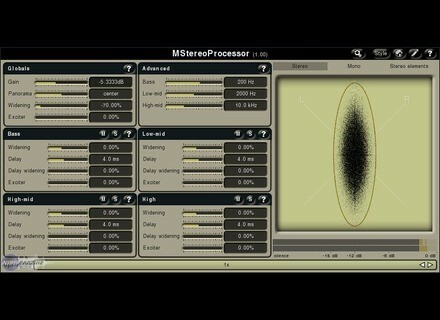 MStereoProcessor is described as "an advanced multi-band stereo analyzer and enhancer." It is designed to let you look at and listen to the stereo field and its mono compatibility, ensure your recording is truly placed into the center, and widen, shrink and excite stereo on separate bands. Global panorama, widening and exciting - you can modify the panorama and widening of the signal itself. The algorithm is totally transparent and mono compatible. You can apply a broadband exciter to improve clarity of each band. 4 bands with separate widening and exciting - while it is often desired to have bass stereo field minimal as opposed to treble, MStereoProcessor lets you process all bands separately. You can modify the stereo field from mono to 200% increase and even perform delayed stereo enhancement. Both algorithms are fully transparent and mono compatible. You can apply an exciter to improve clarity of each band. 2D stereo field analyzer and channel peak meters - integrated analyzers give you an accurate view of the output stereo profile, which you can use to ensure the recording is accurately wide and has correct direction. Mono/stereo field check - you can easily check if your recording is mono compatible and what the stereo content actually is. Mute and solo for each band - you can always listen to each band and check that each spectral part of the recording is perfect. Advanced user interface - you can change all values and use textual editing. Adjustable up-sampling 1x-4x to minimize aliasing. 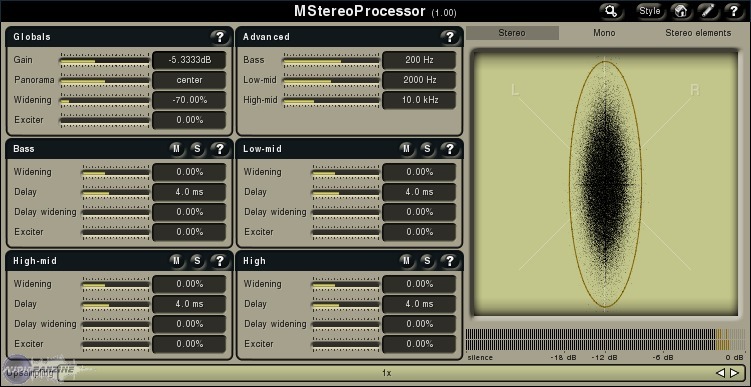 MStereoProcessor is available for Windows as a VST effect plug-in with an MSRP of €99, although it is currently available for the introductory price of €50. It has also been added to the MMasteringBundle. Overloud TH1 Updated To v1.1.1 Overloud has updated TH1 to v1.1.1. Mellowmuse ATA Updated To v1.2e Auto Time Adjuster, which is RTAS only, has just been updated to v1.2e. 4Front Piano & Bass Plug-ins Updated 4Front Technologies has released version 1.1 updates for the freebie 4Front Piano and 4Front Bass plug-ins for both Windows and Mac OS X.